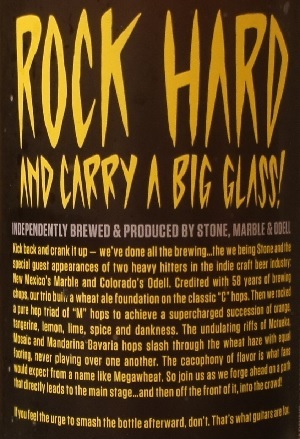 Brewer Description: (from bottle) Kick back and crank it up – we’ve done all the brewing… the we being Stone and the special guest appearances of two heavy hitters in the indie craft beer industry: New Mexico’s Marble and Colorado’s Odell. Credited with 58 years of brewing chops, our trio built a wheat ale foundation on the classic “C” hops. Then we rocked a pure hop triad of “M” hops to achieve a supercharged succession of orange, tangerine, lemon, lime, spice and dankness. The undulating rifts of Motueka, Mosaic and Mandarina Bavaria hops slash through the wheat haze with equal footing, never playing over one another. The cacophony of flavor is what fans would expect from a name like Megawheat. So join us as we forge ahead on a path that directly leads to the main stage… and then off the front of it, into the crowd! 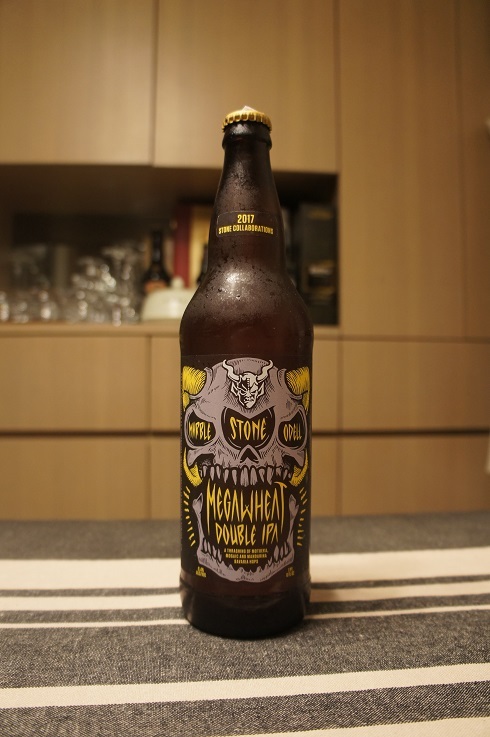 If you feel the urge to smash the bottle afterwards, don’t. That’s what guitars are for. Intro: A 22 oz bomber, bottled on 9th January 2017 and to be enjoyed by 6th April 2017. Poured into a Lost Abbey teku glass. Appearance: A clear copper orange colour with a two finger white head that had great retention and nice lacing. Aroma: Orange flesh and peel with hints of honeydew melon. Taste: Bitter with lots of citrusy orange peel and pith, pine, dankness and hints of apricot plus melon. I’m also getting a tinge of alcohol here and there. 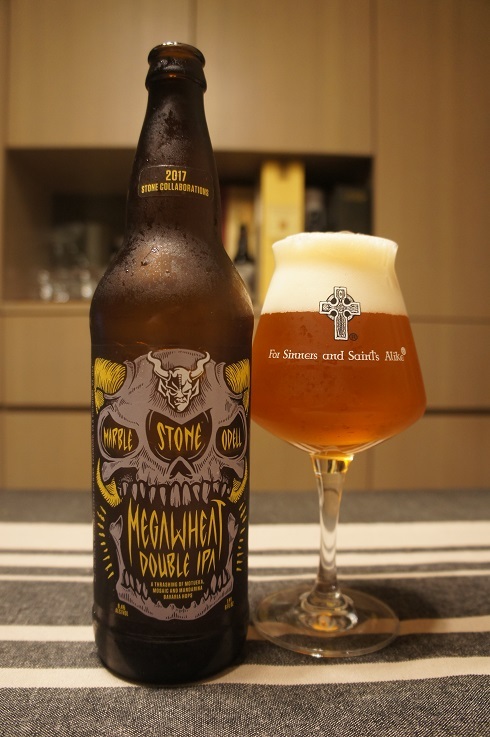 Overall: This was ok, but mainly, I’m just not fond of getting any sort of alcohol booziness in any IPA, and in this case, I kept getting a tinge of just that, here and there.